The tactical and strategic needs of the military forces compelled meteorologists to postpone their personal research projects during the war. Academic meteorologists turned their attention to the most difficult problems first. Chemical warfare, which had been such a critical component of the war-fighting arsenal in World War I, was less important in World War II. The Chemical Warfare Service realized they needed very specific meteorological information if they were to use chemicals effectively. Navy meteorologists took on this problem, establishing a special training unit that provided techniques for determining weather conditions just a few feet above the ground—the area that experiences the greatest impact from chemical weapons. 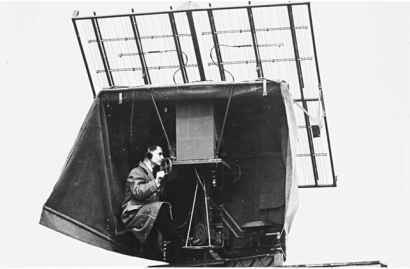 An SCR-658 radio direction finder ("bedspring" antenna) tracks a radiosonde in this photograph from around 1945.
institute developed forecasting rules for tropical regions that could be used by military forecasters, particularly those on remote islands who had access to very little information. Some senior academic meteorologists, including Sverre Petterssen and Jacob Bjerknes, traveled to Newfoundland, Greenland, Iceland, Labrador, Alaska, and India to gather information on weather conditions that could be passed on to the military officers receiving weather training. Long-term projects were divided up among the Big Five meteorology programs. Meteorologists started analysis and atlas projects to study large-scale atmospheric patterns and the resulting weather. Researchers in climatology projects compiled large amounts of data from critical military stations and calculated long-term averages of temperature, precipitation, and air pressure. On the basis of these climatological data, military planners determined the best locations and orientations of landing strips and the best (or worst) times for launching particular military operations. Projects dealing with the collection and study of upper-air observations were particularly important because it was impossible to determine the atmosphere's dynamic structure from surface data alone. The increased availability of upper-air reports gave meteorologists their first opportunity to study the general circulation of the atmosphere better. Their findings gave forecasters greater knowledge for predicting flight conditions and for making longer-range forecasts (several days instead of just one or two). New techniques for measuring ozone and its relationship to circulation patterns were especially important to military planners, who needed at least a tentative forecast a week in advance.